Bates College presents John Reed’s All the World’s a Grave, a new play weaving together some of Shakespeare’s most compelling characters and language, in performances at 7:30 p.m. Thursday, Friday, Sunday and Monday, Nov. 12-13 and 15-16, and at 1 p.m. Sunday, Nov. 15, in Schaeffer Theatre, 305 College St. Professor of Theater Paul Kuritz directs this theater department production. Admission is $6 general admission and $3 for senior citizens and non-Bates students. For more information, please visit www.batestickets.com or call 207-786-6161. Playwright John Reed holds a public “talkback” at 4 p.m. Monday, Nov. 16, in Schaeffer Theatre. His visit is sponsored by the college Learning Associates program. Grave is a darkly humorous imagining of the ultimate Shakespearean tragedy. 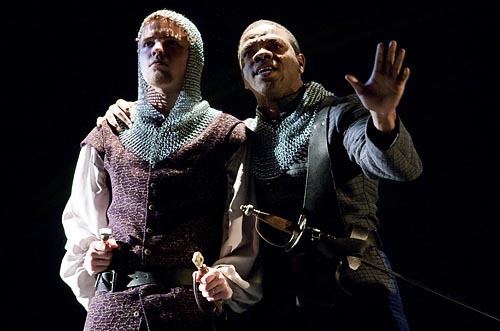 Published in 2008 as a book and staged in full productions only twice to date, Reed brings characters from Othello, Hamlet, Romeo and Juliet and other of Shakespeare’s greatest hits together into a dark and twisted piece of theater. In Reed’s story, Hamlet has gone to war for his wife Juliet, the daughter of King Lear. Hamlet returns home to find that his mother has murdered his father and married Macbeth. Then enters the ghost of his murdered father, the King, who torments the prince — who is further provoked by Iago who persuades Hamlet that Juliet is having an affair with Romeo. As the prince goes mad, a tale far too familiar unfolds. He adds, “Students working on this play will have to confront questions not faced by actors in over 400 years of acting Shakespeare. We all come to the play without the knowledge of past productions or critical responses. We must discover what it means and how it means just as Shakespeare’s actors did. Two students in the play, Caroline Servat of San Francisco (the Queen) and Marielle Vigneau-Britt of Canton, Conn. (Juliet), are performing as part of their senior honors theses in theater. Designing costumes for the production is Carol Farrell, co-director of Freeport’s Figures of Speech Theatre, known for its imaginative productions that combine puppetry and other theatrical forms. Michael Reidy, a lecturer and technical director in the Bates theater department, is the set and lighting designer.